Aortic atherosclerosis is a medical term describing a very serious condition, in which your aortic artery will be atherosclerosed. But where is aorta? Why it is so important? What about atherosclerosis? Why it is that dangerous? In fact, the biggest artery in your body is the aorta. It starts from the left ventricle of your heart and is the largest artery in the body, originating from the left ventricle of the heart and spreads down to your abdomen. In the abdomen, the aorta branches into 2 smaller arteries where it branches into two less small arteries. The importance of the aorta lies in its function of supplying all parts of your body with oxygenated blood. 1.Ascending aorta : lies between the heart and arch of aorta. 2.Arch of aorta : the part of aorta which resembles an inverted U . 3.Descending aorta: the part of the arch of aorta before it branches into common iliac arteries. 4.Thoracic aorta: This is the part of descending aorta directly above the diaphragm. 1.Abdominal aorta: the final part of descending aorta under the diaphragm. Like all arteries in your body, the aorta is elastic in nature, consists of layers of smooth muscle fibers, nerve cells, and endothelial cells. Atherosclerosis disease (or arteriosclerosis) is a life threatening vascular disease, it occurs due to accumulation of fatty debris (plaques) on the inner walls of your arteries. These plaques will definitely thicken as well as harden your arteries, and finally they will completely block these arteries. Imagine when such a dangerous illness happens to such a vital artery. A disaster, isn’t it? This fatal condition is called aortic atherosclerosis. Aorta is one of the first big arteries affected with atherosclerosis. Atherosclerotic narrowing may occur along with, or before, or after coronary or carotid atherosclerosis. Atherosclerotic process might affect the five parts of the aorta at the same time, or gradually. 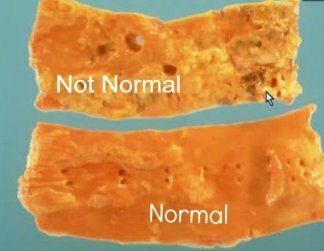 Unfortunately, aortic atherosclerosis general symptoms vary according to whether atherosclerosis affects your thoracic aorta and/or abdominal aorta. Almost about 75% of the atherosclerosis of aorta occurs in the segment of your aorta which is in your abdomen. The other 25% occurs in your chest causing atherosclerosis of thoracic aorta. According to New England Journal of Medicine, thoracic aortic atherosclerotic is a potential high risk factor for formation of cerebral embolism and development of ischemic stroke. You might also experience pain in the abdomen or chest. Back pain (disc complications) is common symptom for atherosclerosis of abdominal aorta. Oh dear. What are the causes of this serious disease? How can I prevent it? Your doctor can tell you that the exact causes of aortic atherosclerosis are not yet known. However, specific conditions may increase the risk for it; some of these high risk factors can be controlled by you, like loss of physical exercise, cigarette smoking, obesity, and fatty diet. Other factors can’t be controlled such as aging, or familial history of atherosclerosis. If you make some serious lifestyle changes, eat healthy food, keep normal weight and take your prescribed medicines regularly, you will definitely have a great opportunity to prevent or at least stop damage caused by aortic atherosclerosis. As cholesterol is one the major factors for atherosclerotic disease, the above steps will help lowering your high cholesterol numbers. How to survive Atherosclerosis Disease. Get your Coronary Atherosclerosis most known facts. For Reversing Atherosclerosis, this works like crazy.